SALT LAKE CITY--(BUSINESS WIRE)--Altra Running introduces the patent pending Altra IQ™ powered by iFit® -- the world’s first shoe-able -- at the 2015 Outdoor Retailer Summer Market. A running shoe that’s able to collect data about your stride as you run, making you better informed about your own personal biomechanics. A razor-thin, multi-sensor system embedded in the shoe’s midsole tracks a range of running intelligence, such as exactly where you’re striking on your foot. 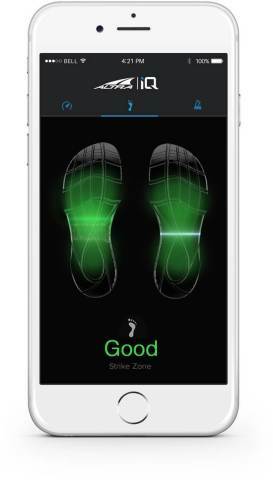 Then, using Bluetooth technology, the Altra IQ shoes transmit your data to an iFit app or watch, which will provide individual analysis and real-time coaching on the run. Like all Altra shoes, the Altra IQ features the brand’s signature FootShape™ toe box, Zero Drop™ sole and proprietary A-Bound™ cushioning. Come to booth #38178 to see this shoe and the Altra footwear line at Outdoor Retailer Summer Market. How it works: Each Altra IQ shoe will have a flexible multi-sensor system that runs the length of its midsole, embedded (along with a transmitter) in a hollowed out groove. The technology doesn’t alter the shape or the feel of the foot bed – it’s designed to be invisible and totally imperceptible by the runner. Each shoe’s sensor system will convey the Altra IQ’s running form intelligence via Bluetooth BLE to the app or to an iFit watch, sold separately. The app will be free and available for Android and iPhones. Data will also be hosted at the innovative running and fitness site iFit.com, so runners can monitor their improvements over time. The screen on the Altra IQ app will show each of the various metrics collected. Specific recommendations for improving individual aspects of your running form will be both visible and audible via your smartphone and/or iFit GPS watch, sold separately. A select team of running experts, coaches and exercise physiologists created the analytics and feedback suggestions. There are devices in the market that measure a few of these metrics, said Altra founder Golden Harper. "However, nobody has something that will tell runners 'You are over-striding. Try pumping your elbows back and not letting them swing forward past your hips,'" Harper said, as an example. "The Altra IQ shoes are a running coach in a shoe: observing running form, analyzing, and suggesting real-time corrections to help the runner dial in their form as they run." 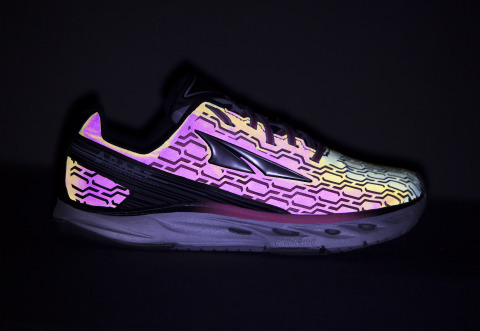 The Altra IQ shoe powered by iFit is built on the same last as Altra’s new Impulse shoe. The durability of the flexible electronics packet has been tested in an ISO 9000-rated laboratory and is rated for 1 million+ cycles of bending, or about 600 miles. Designed and built for rain, puddles and normal outdoor running. Recommended hand wash, air dry instead of machine wash.
Altra founder Golden Harper has led hundreds of Altra’s Run Better clinics at races and specialty footwear retailers around the world. The sessions focus on running form analysis and coaching. He said even the most experienced runners learn something new from the Altra IQ, because good runners are always looking to improve. For that reason, Harper sees the Altra IQ shoes for runners of all levels and abilities. Altra Footwear is now the 9th largest running shoe brand sold in the run specialty channel, after impressive growth from its founding in 2011, according to data from NPD. Altra’s running shoe innovations are born from long hard runs in the Wasatch Mountains, just minutes from Altra’s Utah headquarters. Founder Golden Harper invented a cushioned Zero Drop shoe and a foot-shaped toe box, features that are now found on every Altra shoe. Harper is a former All-American runner who loves to trail race and run to the top of difficult mountain summits. Co-founder and VP of Sales Brian Beckstead finished a respectable 145th at Ultra Trail Mount Fuji last year, and plans to run 4 ultra-marathons in 2015, including the UTMB, Ultra-Trail Mount Blanc and Wasatch 100. Altra® Footwear and iFit® technology are registered trademarks of ICON Health & Fitness, the world’s leading health & fitness innovator, based in Logan, Utah. Follow @AltraRunning on Twitter, Instagram and Facebook and #EmbraceTheSpace and #ZeroLimits. Altra® Running Introduces the Altra IQ™ powered by iFit®, the world’s first shoe-able™ with intelligence, personalized analysis and real-time coaching to help optimize your running form.